Aha! To be in the land of the Pharaohs and of Cleopatras; to breathe deep the air of ancient civilization; to marvel at the pristine blue of the Red Sea; to let the senses reel under the inexplicable experience of a cruise on the Mother of All Rivers. My stay in Egypt was a mixture of discovery and pleasure. It was difficult not to be overwhelmed. The sheer mathematical precision and design of the Pyramids at Giza at once awed and humbled me. Did the Kings really ascend to the after life to find a place amongst the gods? Or were the elaborate preparations (started by them in their lifetime on earth) for the journey to the next world, all in vain? These and other questions will remain unanswered forever. Pharaoh Khofu, who built the biggest tomb for himself, also has the dubious distinction of being represented by his smallest sized statue at Cairo Museum, as he was supposed to be very ugly and not liked by his people. This is just one of the many contradictions I came across. As I drank deep of the air over the River Nile, I was denied the basic human right of free drinkable water. No hotel (big or small) across Egypt provides free drinking water. A one litre bottle of water costs 5 Egyptian pounds (approx. Rs.40) or more. Petrol is much cheaper at 2 pounds a litre (Rs.16). But the body cannot survive on petrol. So buying water was one of my major expenses. The dazzling display of artifacts at the Egyptian Museum was overpowered by the tell tale signs of abject poverty spilling around me. Outside an alabaster factory, a worker gave me a piece of polished limestone (with a figurine etched on it), in return for a pen. He said he had three school going children. This he did with other tourists also. Although Cairo, Luxor, Aswan, Hurgadha, still retain an old world charm and have very few high rise buildings, they are all very high on smoke. Despite signing and ratifying the global tobacco treaty (formally known as the World Health Organization Framework Convention on Tobacco Control - WHO FCTC), the Egyptian government seems to have done nothing to curb the menace of tobacco. Of course there were ‘no smoking' signs everywhere, with people puffing away merrily under those signs. 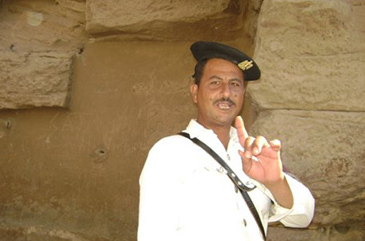 At the entrance to Karnak Temples, I clicked a policeman smoking close to a ‘No Smoking' sign. He really got angry at me and said that I was not allowed to photograph a police man. When I pointed to the 'no smoking sign' he just walked away. Different types of tobacco in very attractive packing are sold everywhere. I found it impossible to walk even a few steps in the market and other places, without encountering cigarette smoke. Another very common sight was that of a hookah smoker. Inside the Ramses Perfumes Palace , the air was thick with the fragrances of flower perfumes. A delicate touch of the pure essence oil of lotus, narcissus, jasmine, lilac, golden water, behind the ear or on the hair assured a fragrance lasting for several days. Blends, going by exotic names like ‘secret of the desert,' ‘thousand and one nights,' ‘omar el sherif,' ‘papyrus flower' and ‘queen Cleopatra' arouse the sensuous in you. Then there is kohl to beautify the eyes and incense to perfume the apartment. 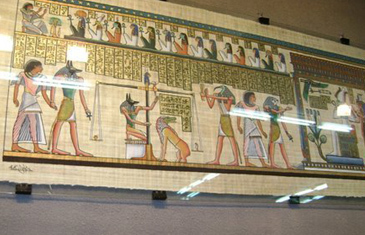 Papyrus painting is to Egypt , what ‘chikankaari' ( a special form of hand embroidery) is to Lucknow . It was wonderful to watch the making of papyrus paper from the stem of the plant. And the beautiful paintings of Egyptian gods and goddesses and floral designs executed with finesse, similar to our own madhubani paintings. I found a lot of similarity between them. The trip to Egypt can never be complete if one has not savoured the delights of bargaining in a typical Egyptian bazaar (like the khan khalili market at Cairo). Haggling indeed is an art form in Egypt . It is perhaps expected and, from the local point of view, encouraged as a way of communication and human contact. Being an Indian, I enjoyed it immensely. The shopkeepers have a habit of touching you, praising your beautiful face and hair, cajoling you to buy their goods with all the vile trickery at their command. Once they knew that I was an Indian, they even took the name of some bollywood movies and expressed their admiration of Amitabh Bachhan and Shahrukh Khan. I had been warned by my guide not to fall in their trap, but I did. I bought a pair of ear rings for 60 pounds, which were quoted at 250 pounds. When the bargain was finally struck, the old shopkeeper said to me, ‘God Bless You,' ‘For what?' I wondered. Perhaps, for allowing him to cheat me. Of course, how could I leave Egypt without buying a cartouche, the oval shaped good luck charm. It has symbols of eternity, love and protection etched on it. One can also get one's name etched in hieroglyphic script on it. It is generally worn as a pendant or as earrings. My senses are still spinning like the Tanoura Dance, the Egyptian version of the Sufi whirling dervish dance, performed mainly at Sufi festivals. It was awesome to see the male dancer spinning non stop for nearly half an hour, juggling with 5 tambours; twisting and turning as his multicoloured long skirt created the illusion of a human kaleidoscope. In the words of Jalaluddin Rumi, ‘There must be a purpose, a cause for existence, and inside the cause, a true human being.' So be it.